A full length 100% polyester one piece gown that measures 54" long from the center back to the hem, 52" at the waist, 54" around the bottom and has a 3 1/2" black cuff at the end of each sleeve. Also included is a silver painted latex tie on belt (latex design is in the front only) and the silver painted latex medallion on a cord. The silver and black mask is considered a 3/4 face mask as it is open under the teeth and is held on by an elastic strap which means the back is also open. 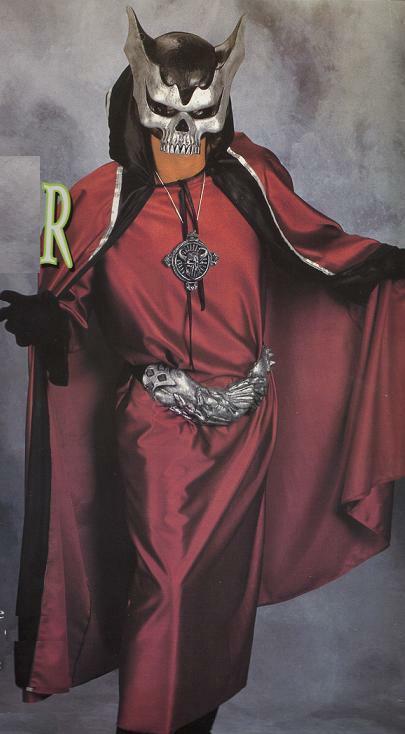 THE CAPE PICTURED DOES NOT--NOT COME WITH THIS COSTUME--I DO NOT UNDERSTAND WHY THE COMPANIES USE PICTURES LIKE THIS, AND THIS CAPE WAS NEVER AVAILABLE! This is a one size fits most. A great costume for any ghoulish character. Hand wash cold, line dry. ALL SALES ARE FINAL.